Our daughter Sophia is a Mia Hamm fan. Actually, that’s not entirely true. She’s a Mia Hamm fanatic. She watches videos of Mia on YouTube, searches for online articles about Mia, and has read books about – and by – Mia. 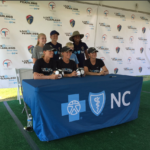 You can imagine how excited she was on the day of Blue Cross and Blue Shield of North Carolina’s (Blue Cross NC) Live Fearless Soccer Clinic – the day she was finally going to meet her hero. That morning, her soccer team played an out-of-town game, the first game for a new team of 11-year-old girls. The team was still figuring out which position suited each child the best, and they ended up losing. The final score wasn’t pretty. Sophia saw a positive sign in the loss. All through the game, her coach had urged the team to communicate on the field, to talk to each other. In the final seconds of the game, Sophia scored a goal. On the car ride home, she alternated between giving a play-by-play recap of the game and excitedly preparing to talk to Mia later that afternoon. She even wrote some questions to ask Mia – which she arranged in order of priority, in case she didn’t get time to ask all of them. I suspect she was a little nervous about coming face-to-face with the woman who’s inspired her to Live Fearless. Fortunately, when she got her chance to talk to Mia, she wasn’t tongue-tied or shy. She asked the questions she’s written, and she had Mia’s full attention. I’m happy to report that Mia lived up to all of Sophia’s expectations. My husband and I try to lead by example, and we try to teach Sophia how to Live Fearless. We’ve talked to her about how to learn from losses, how to keep persevering, how to stay focused on your personal goals. One of the most important parts of the Live Fearless attitude is knowing that you can’t do everything by yourself – sometimes you have to rely on the people around you: your family, your friends, your teammates. The key is having the confidence to ask for their help. But as parents, we know that hearing those lessons from Mia, her idol, carries a lot of weight. We’re glad there are people like Mia that Sophia can look up to, people who have persevered through losses and keep getting up whenever they’re knocked down. It seems like Mia realized very early in her career that she had a great responsibility to set an example for women and younger girls. I think she’s lived up to that responsibility. The Blue Cross NC Live Fearless Soccer Clinic is a chance for young girls to learn some new soccer skills from some of the best women players in the world – Mia and her partners from Team First Soccer Academy, Kristine Lilly and Tisha Venturini-Hoch, along with players from the Triangle’s professional women’s soccer team, the North Carolina Courage. 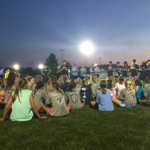 At the clinic, Sophia and the other girls also learned how to fuel their bodies with nutritional foods, how to stay hydrated, and how to identify concussion symptoms. More importantly, they learned how they can apply the Live Fearless philosophy to their own lives. But the clinic isn’t just for young girls. Mia and her team had some important messages for parents, too. The most important was about the car ride home after games. When Mia talks to girls about what they like and don’t like about sports, she inevitably hears girls say they don’t like the car ride home – because that’s when parents point out the things they did wrong during a game, and they might say some nasty things about coaches or referees. Hearing those things, children learn to live with fear. They learn that their parents don’t think their best is quite good enough. They learn to hate sports. Mia urges parents to remember they’re not supposed to be living their own unfulfilled sports dreams through their children. Sports are meant to teach kids how to enjoy an active life, how to win and lose with grace, how to make a commitment to your teammates – and to follow through on that commitment. Sophia loves being part of a team. She loves contributing to something, pushing herself to see how far she can go. She enjoys seeing how far the team can go when the players work together. That’s how Sophia chooses to Live Fearless. Knowing that she understands that allows me to Live Fearless, too. 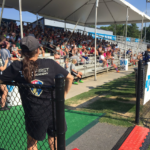 Our family’s thanks go to Mia, Kristine, Tisha and the NC Courage for a wonderful day of coaching – in soccer and in life. 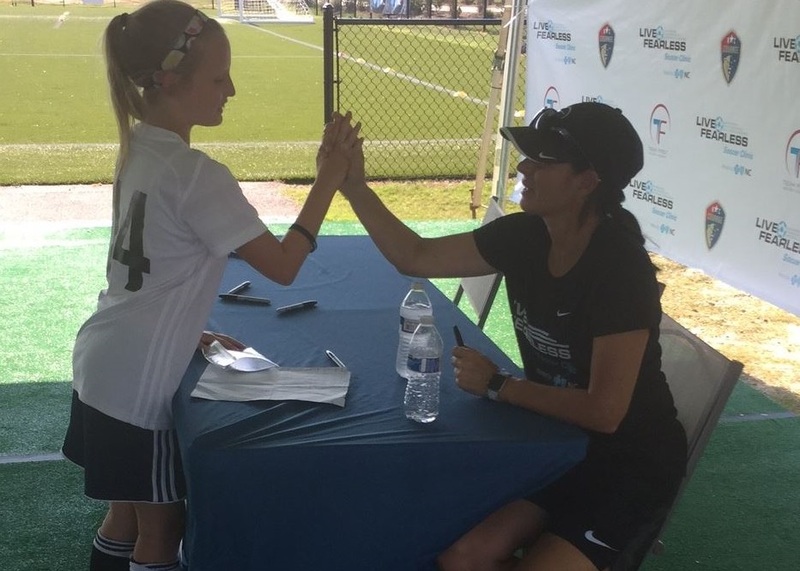 Jennifer is a proud mother and, like her daughter, Sophia is a fan of Mia Hamm. Jennifer and her family have embraced the Live Fearless outlook on life, seeking new experiences and enjoying their own individuality – without fear.